Mike Murdock is a shyster and an imposter! I couldn't believe what this guy was saying on TV today when I listened to him. He was spewing out blasphemies against God by claiming that God wanted to create 300 MILLIONAIRES through his ministry. The catch? ... you MUST send a "seed" (as he calls it) of at least $1,000 to his ministry. You've got to be kidding Mike? Murdock calls the donation to his ministry "a seed of obedience." Obedience? Obedience to whom? Why not give the money to a local church? Why does the money have to go to MURDOCK'S MINISTRY? Sadly, many people are foolish and gullible enough to send him a thousand dollars. He actually tells his listeners to call in and say, "I'm one of the FUTURE millionaires that Dr. Murdock talked about who will sow the $1,000 seed." This is so sickening. Murdock kept saying, "I feel so stirred about this business." Yeah, I'll bet, money does stir most people. Murdock dares to call himself a "man of God"; but he is a wolf in sheep's clothing. Just as evil Balaam, Murdock is greedy of gain. Murdock promises 3-months of miracles and uncommon blessing to those who give the $1,000 seed. He distorts the meaning of "faith" by defining it as "expectation." The problem is that faith is more than just expectation. America is filled with people walking around expecting God to bless them, while we murder our children through abortion and allow homosexuals to parade up and down our streets. Most unbelievers are religious, such as Catholics, who errantly think they are going to Heaven one day; but, they are NOT. They are trusting in men's traditions to save them, rather than solely trusting upon the Lord Jesus Christ (Mark 6:6-13; Romans 10:3-4). Murdock states ... "What you keep is your harvest; what you sow is your seed." He says, "God is waiting for you to let go of what's in your hand, so He can let go of the harvest that's in His hand." Such statements are certainly luring and no doubt cause many ignorant listeners to send him money. I had to laugh when Murdock said, "I feel something special concerning the credit card, because the sooner you get your seed into the ground the sooner you will reap God's harvest of blessing." Talk about high-pressure sales tactics! Mike Murdock is nothing more than an upscale car salesman, except he's selling NOTHING for something. Think about it ... at least with a crooked car salesman you get an automobile (even if it turns out to be a lemon). With Murdock you get NOTHING for your money except empty promises! Dr. Murdock further states, "Wrap your expectancy around the seed of your $1,000." Listen friend, just because you're dumb enough to send some con artist your hard-earned money DOESN'T guarantee you anything--except being out a thousand dollars! Mr. Murdock then says, in desperation for your money ... "Don't let that busy-signal be your enemy." Truthfully, that busy-signal just may be your best friend! Dr. Murdock subtly twists the Bible when he claims, "Delayed obedience becomes disobedience" in reference to giving to HIS ministry! Delayed obedience to God is certainly a sin; BUT, Mike Murdock is NOT God, and God DIDN'T command us to give any money to Murdock's ministry. Murdock uses psychology by making people assume that God has commanded us to donate $1,000. Murdock never gives the listener the opportunity to DECIDE for themselves whether or not they should give in the first place. Murdock simply states, "Delayed obedience become disobedience." In effect, Murdock subconsciously places guilt upon his victims by inferring that they're disobeying God if they don't send $1,000 to the Mike Murdock Evangelistic Association. It is appalling to the name of decency. 1. That God will use this seed to schedule an uncommon visit from the Holy Spirit to your home. I'm asking God to give you a stress-free home environment. An unusual visit from the Holy Spirit. 2. A financial mentor to enter into your life, who will use their secrets to enhance your life, with uncommon financial wisdom. 3. That God will use this $1,000 seed to reactivate every dormant seed you planted in the past. God will use this seed of obedience today to breathe new life into your future. And whatever the Devil stole from you in the past will be returned unto you 7-fold. What a bunch of lies! Mike Murdock doesn't have the authority to say those things. The Holy Spirit of God isn't for sale. Murdock sounds much like Simon the Sorcerer who thought he could buy God's power with money (Acts 8:19-20). God is NOT for hire! Notice how all three of the promises from Mike Murdock are based in sinful covetousness and greed. How dare Mr. Murdock turn God's house into a den of thieves, "Is this house, which is called by my name, become a den of robbers in your eyes? Behold, even I have seen it, saith the LORD" (Jeremiah 7:11). Murdock cleverly leads his audience away from recognizing him as a thief, by calling Satan a thief instead. Satan certainly is a thief (John 10:10), but he has many apprentices working with him as well (2nd Corinthians 11:13-14). Even a lying con-man looks honest when contrasting himself to Satan. Murdock is stealing money from God. According to Murdock, the third item on his prayer list is for God to force Satan to give back 7-fold anything he stole from you. It sounds nice; but there's no such teaching in the Word of God. It is sinful and dishonest for Murdock, or anyone else, to make all sorts of guarantees and promises on behalf of God in exchange for their viewer's money. If Murdock is so blessed of God, and if even half of what he teaches is true, then why is he desperately trying to victimize people by swindling away their money? I couldn't believe Murdock actually said that he felt some special leading from the Holy Spirit for people to use their credit cards. If that's not a smoking gun to prove he's a con-man, then what is? We hear such high-pressure sales tactics every day from crooks and cons in the heathen world ... we shouldn't be hearing them from a professed "man of God." 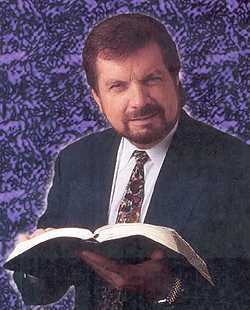 Mike Murdock is NO man of God; but rather, a sinister minister! Murdock Exploits Christianity and Perverts the Word of God! According to Murdock, "An uncommon seed always creates an uncommon harvest ... The SIZE of the seed determines the uncommon harvest ... The size of the seed determines the size of the harvest ... The size of your seed predetermines the size of your harvest." Clearly, he wants your MONEY! Murdock then misapplies the Word of God once more, using the Scripture in Luke 6:38, "Give, and it shall be given unto you; good measure, pressed down, and shaken together, and running over, shall men give into your bosom. For with the same measure that ye mete withal it shall be measured to you again." Would you please read back just one verse to Luke 6:37, "Judge not, and ye shall not be judged: condemn not, and ye shall not be condemned: forgive, and ye shall be forgiven." Clearly, Jesus was speaking about forgiveness here, and NOT financial gain! In Mark 4:24 Jesus is speaking about the truth of God's Word, NOT finances ... "And he said unto them, Take heed what ye hear: with what measure ye mete, it shall be measured to you: and unto you that hear shall more be given." Jesus never mentioned money or finances in these Scriptures. Just because you give to God is NO guarantee that men will give it back to you. If fact, Jesus taught the opposite in Luke 6:35, "But love ye your enemies, and do good, and lend, hoping for nothing again; and your reward shall be great, and ye shall be the children of the Highest: for he is kind unto the unthankful and to the evil." Murdock teaches that our "expectation" (hope of receiving) IS OUR FAITH. But Jesus said to hope for NOTHING in return. Hmmm. Clearly, faith is far more than just optimism and selfish expectations. Biblically, faith is obedience to God's Word. Murdock would lead you to believe that God has commanded you to give your money to Mike Murdock; BUT, God has not! God would NEVER lead anyone to donate money to a ministry that fails to preach the Gospel. I didn't hear even one mention from Mr. Murdock on how to be saved and go to Heaven, just on how to become a financial MILLIONAIRE! He made NO mention of sin or repentance either. Man of God? I think NOT! Murdock appeals to people's greed and selfishness by magnifying what they're going to get in return for their contributions. This is NOT what Christianity is about. Murdock often makes the statement, "What is in your hand today can become anything you want in the future." Boy that "anything you want" sure sounds good doesn't it? Realistically, life doesn't work that way Mr. Murdock. God is not an Aladdin's lamp. Yes, we are heir to all things in Christ as believers; but that doesn't guarantee financial success here on earth. Look at poor Lazarus who ate from the rich man's garbage. God's earthly blessings come in many forms: life, children, a job, health, wisdom, friends, success; BUT, we are NOT guaranteed ANY OF THEM. Paul suffered horribly as a Christian (2nd Corinthians 11:24-27). Jacob's beautiful and beloved wife, Rachel, died while giving birth to Benjamin (Genesis 35:18,19). Moses had a speech problem, possibly from a stroke (Exodus 4:10). The Bible is filled with such realities of life. The only guarantee for the believer is that we are going to Heaven, and that's worth more than all the gold in the world! God only had one Son without sin, but He never had a son without suffering. Suffering is a part of life. Any preacher who says different is a liar. The next best thing to being saved is winning others to the Lord. Matthew 16:26 proclaims, "For what is a man profited, if he shall gain the whole world, and lose his own soul? or what shall a man give in exchange for his soul?" Soulwinning is the dearest thing to the heart of God (Romans 10:15). Murdock appeals to the sinful covetousness of people by tempting them with becoming MILLIONAIRES. The only SURE millionaire is Mike Murdock! Murdoch claims that God spoke to his heart and told him that He wants to create 300 MILLIONAIRES for the Gospel's sake. Why does God need 300 millionaires when He owns everything? 1st Corinthians 10:26 states, "For the earth is the Lord's, and the fulness thereof." Murdock is just another demonic health, wealth, and prosperity preacher from Hell. He speaks of money, blessing, and financial harvest; without mentioning judgment, sin, repentance, or condemnation. These types of imposters abound like the Black Bubonic Plague, dime-a-dozen preachers who deceive the masses for their own greedy gain. Jesus plainly stated in Luke 10:2, "Therefore said he unto them, The harvest truly is great, but the labourers are few: pray ye therefore the Lord of the harvest, that he would send forth labourers into his harvest." 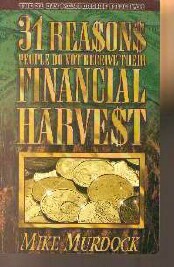 Notice that the Word of God asks for more "labourers" (soulwinners) to go into the harvest; NOT MILLIONAIRES! Mark 16:15 proclaims, "Go ye into all the world, and preach the gospel to every creature." Mike Murdock claims that God wants to send millionaires instead. Suspiciously, Murdock never details how these alleged 300 MILLIONAIRES are going to benefit the Gospel. I am so sick of money-hungry people who profess to be "Christians." Stop exploiting the name of Jesus! Murdock has the gall to associate Jesus' name with his money-hungry methods. It was people like Mike Murdock that Jesus condemned when he became angry and overturned the money tables in the temple, "And found in the temple those that sold oxen and sheep and doves, and the changers of money sitting: And when he had made a scourge of small cords, he drove them all out of the temple, and the sheep, and the oxen; and poured out the changers' money, and overthrew the tables; And said unto them that sold doves, Take these things hence; make not my Father's house an house of merchandise." God HATES when anyone exploits the things of God to make money. It is sacrilegious. In sharp contrast to the garbage Mile Murdock teaches, listen to what Jesus said concerning a poor widow in Mark 12:42-44 ... "And there came a certain poor widow, and she threw in two mites, which make a farthing. And he called unto him his disciples, and saith unto them, Verily I say unto you, That this poor widow hath cast more in, than all they which have cast into the treasury: For all they did cast in of their abundance; but she of her want did cast in all that she had, even all her living." The poor widow DIDN'T have to give $1,000 to qualify for an "uncommon blessing." No, she only gave two mites, but Jesus said she gave more than all those self-righteous rich people. It's not how much you give to God that matters; but how much you keep back for yourself. But please understand, we shouldn't throw God's money away by giving it to imposters who do little or nothing for God. Please read my articles Tithing and Giving Responsibly and Tithing Fools. We should NEVER give our money to any organization that is lax concerning the preaching of the Gospel (1st Corinthians 1:18; Romans 1:16). Truthfully, it is God's money--not ours. You'd be SHOCKED if you knew just how many ministry leaders (or non-profit organizations) make over $1,000,000 a year. No doubt, this is why James Robison refuses to disclose his personal finances to the Better Business Bureau. I'd NEVER give one dime to any ministry or non-profit organization that pays ANYONE over $100,000 a year salary. It's sickening! Non-profit? What a misnomer! "He's always for years and years used his birthday as a tool for subtly hinting that he should be given birthday presents," Anthony said. "There's something so sleazy about that it makes one sick to their stomach." One donor who gave Murdock a birthday gift in 1998 was surprised to learn that his compensation package from the ministry that year totaled more than $337,000. $337,000!!! Talk about a den of thieves! I wonder how much of that money went towards winning people to Christ? I wish the people who foolishly give all that money to phony televangelists would use their brains for something besides a sponge. People are so gullible nowadays! That's why Mr. Catholic ecumenicalist heretic, Benny Hinn, takes in over $100,000,000 a year!!! The problem is that people are naturally lazy, so they sit home and then see these rotten preachers on TV who are EXPERTS at manipulating naive people. The result is that people are suckered in by con-artists because they refuse to STUDY the Word of God on their own. Dr. Murdock is smooth and convincing. If I didn't know the Bible well enough, I probably would have sent him the $1,000 just to see what would happen. And that's exactly what a lot of idiots do. In 2nd Samuel 24:25, David presents burnt and peace offerings to the Lord to turn away God's wrath against Israel. God had sent a plague upon Israel which had already killed 70,000 people in just 3-days. The Lord accepted David's offerings and then the plague stopped. Dr. Murdock tries to use this Scripture as evidence that giving money to the Lord through MURDOCK'S MINISTRY will remove any plagues from our life. This is NOT true. David's offerings were an attempt to appease the wrath of God, because of his sin, which they did. Carefully notice in 2nd Samuel 24:10 that David realized the sin he had committed, and begs for God's forgiveness; but, David's sin came with consequences. Seventy-thousand people died. Tragically, a nation's citizens often suffer for the sins of their leaders. America is facing certain destruction because of sin. In 1st John 1:9, God promises forgiveness to those who seek it; but, this does NOT alleviate or excuse us from the responsibility of our sins (as seen in 2nd Samuel 24). When David killed Uriah, and commit adultery with Uriah's wife Bathsheba, the resulting child died as punishment from the Lord. It's easy for believers to get the erroneous idea that we can live like the Devil, and then simply claim 1st John 1:9 to remedy everything. This is heathendom, as the Catholics practice at Mardi Gras. Catholics worldwide live in wild sin during the Mardi Gras festivals, and then think going to Lent afterwards will make everything right. No sir! It does not! The Word of God teaches that when a person becomes a genuine born-again Christian that they become a "new creature"--that Creature is Christ in us (2nd Corinthians 5:17). Of course, Catholics AREN'T Christians at all because they trust upon men's traditions for their salvation, instead of upon the Word of God (Mark 6:6-13; Romans 10:3-4; Ephesians 2:8,9). The only forgiveness available for the unsaved is through Christ Jesus alone (John 14:6); but they choose the demonic Virgin Mary and the Church instead. God will forgive a sinner and cleanse away all sin with Jesus' blood; but, the sins themselves must be dealt with. God will hold us accountable for our actions (Romans 12:19, 14:12; 1st Thessalonians 4:6). David was not trying to become financially successful or have a better life. David had sinned. It's worthy to note that David didn't offer God any sacrifices when he apologized to God in 2nd Samuel 24:10; BUT when God chastised David for his sin, now David is offering multiple sacrifices. It appears that God wanted David to learn a much needed lesson in humility. Sometimes when a child apologizes for something, the wise parent realizes that a learning lesson is necessary to ensure that the child isn't taking the matter lightly. This is called "tough love." David experienced God's tough love in 2nd Samuel 24. It is improper and unscholarly for Dr. Murdock to apply the circumstances in 2nd Samuel 24 to becoming a millionaire. David's offerings showed his humility, and that he had learned the necessary lesson. David wasn't trying to become a millionaire! 1st Timothy 6:9 clearly condemns the desire to be rich--which makes Mike Murdock a false prophet! It is a fact that MOST of God's work is accomplished by poorer people than richer people. Dollar for dollar, the poor and middle class do FAR MORE for God than the rich. You don't need money to serve God; but, faith. Anytime you hear a preacher speaking about money more than anything else ... LEAVE!!! Mike Murdock is of the Devil. Where's the Gospel? What about Sin? What about abortion in America--the murderous massacre of tens-of-millions of children? All we hear is money, money, money. The Word of God WARNS us in no uncertain terms in 1st Timothy 6:9, "But they that will be rich fall into temptation and a snare, and into many foolish and hurtful lusts, which drown men in destruction and perdition." You'll never hear Mike Murdock quote this Scripture. Murdock says God wants to create 300 MILLIONAIRES; BUT, 1st Timothy 6:10 says he's a fool ... "For the love of money is the root of all evil: which while some coveted after, they have erred from the faith, and pierced themselves through with many sorrows." One of Murdock's ministry associates on the TV program kept saying, "God's at work tonight Dr. Murdock." You mean the Devil's at work. God is not interested in making anyone a millionaire. The greatest things in life are NOT things. Murdock's associate then said, "People are taking the step of obedience." Well, they might be obeying Mr. Murdock; but they certainly aren't obeying God. I'll give you the BEST ADVICE I can think of concerning televangelists--DON'T GIVE A DIME TO ANY TV PREACHERS!! !--because I don't know of even one of them that is worth a dime! I'd like to see John the Baptist on TV. How long do you think he'd be allowed to remain on TV? Five minutes? Also, and this is a big issue, Dr. Murdoch FAILS to mention to his audience that God is NOT obligated in any way to bless Christ-rejecters. Psalm 7:11 declares that God is ANGRY with the wicked every day. John 3:36 states that the WRATH of God abideth upon unbelievers. Yet, Mike Murdock's appeal for donations, and promises of a brighter future for those who send him money--are apparently available to anybody, saved or unsaved. This is blasphemy! God is NOT bound by any Scriptures to bless the wicked. You can send $10,000,000 to Mike Murdock and you'll just be $10,000,000 poorer. God is NOT interested in your greedy desire to become rich. In John 3:3 Jesus plainly stated, "Except a man be born again, he cannot see the kingdom of God." The popular trend of our day is to talk about spirituality without the Word of God, to talk about salvation without being born again, and to offer hope without Jesus Christ. You'd better get saved if you want to miss Hell and go to Heaven. Mike Murdock does a great injustice to his audience by not warning them about the judgment to come (Acts 24:25), and by leading lost sinners to believe that they can become successful in life without Jesus Christ. This is apostasy and heathendom!